While deciding where to go for lunch on a recent afternoon, a report appeared about Mount Etna erupting in Sicily. While the volcano is Europe's most active and has been for a long time, it seemed only natural that a visit to Avenue U for Sicilian food seemed in order. Joe's has been around for more than 50 years, and now has another recently opened location in Staten Island. The tables and booths seem to look about 50 years old too, the cheap old laminates and vinyl become charming rather than tired though. There is an ode to their biggest team, Unione Sportiva Citta di Palermo, with jerseys and a large Forza Palermo sign in pink, the team's color. On other walls are maps of Sicily and Italian and US flags. The entrance has a counter displaying many of the foods that are available on the menu and does a brisk takeout business as well. The dining room is fairly large and can handle a lot of people, including big groups. As lunch proceeded, other tables were filling up with mostly Italian speakers. The first impression of the women here are these tough Brooklyn ladies that you want to remain on your best behavior around, but you know will never be nice to you. But after your first interactions, this is proven wildly untrue, and they seem to go out of their way to take care of your table and questions. After the two of us ordered everything, our server asked what we wanted first. Saying we would share, she surveyed our small table top and replied "OK, whatever fits!" It was obvious the order was excessive. Perhaps the most famous Sicilian specialties in the United States are arancini, or rice balls. Joe's serves big ones plain for $5.99 or the rice ball special (above) for $7.99. The special gets you a healthy dollop of unseen ricotta cheese on top of the ball, as well as red sauce and parmesan shavings. If you are in the mood for red sauce with no seafood, ordering a bunch of these might be the way to go, as they are delicious. 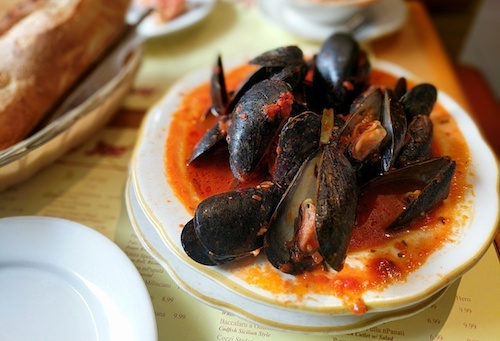 The cozzi stufati (steamed mussels, $8.99, below) are also served with a tomato-based red sauce that is more like a soup. This runs on the sweet side, but works despite feeling odd on first bite. For the price and freshness, this seems like a steal. A must have here at Joe's is the purpu e calamari (octopus and squid salad, $14.99, below), which is served very plain with a bit of olive oil. Squeeze on a little lemon, and nothing else is necessary. 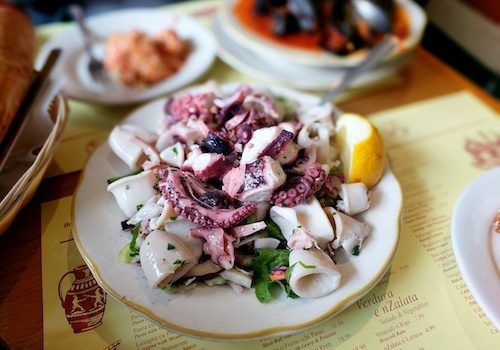 The chunks of both octopus and squid are both larger than normal, and again so fresh. 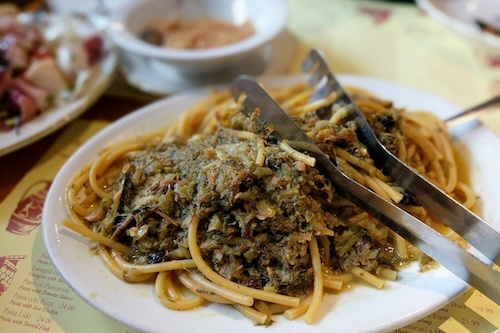 The result of the overorder was that we had hardly any room for the pasta cchi sardi (sardines and wild fennel pasta, $14.99, below), which is served with bucatini as the pasta. Since stomachs were already so full, it did not help that this dish ran rather strongly on the fishy side with the sardines. Wild fennel is plentiful in Sicily and makes for a thick topping, while the wide straw-like noodles are expertly cooked at Joe's. You will find this dish in restaurants around the whole island, but it was created and is still associated with Palermo. 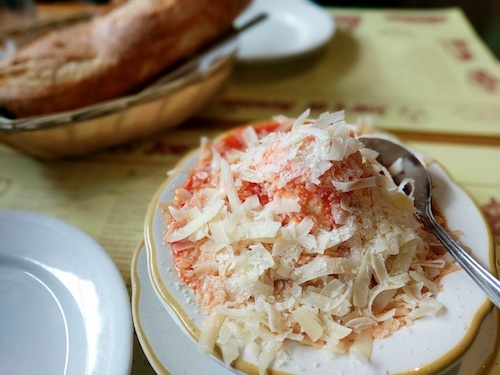 On the side (blurry in the background of the photo), the dish is traditionally served with crunchy breadcrumbs that have been lightly toasted. The dish is also the favorite meal of late justice of the Supreme Court Antonin Scalia, if that makes a difference to your order. 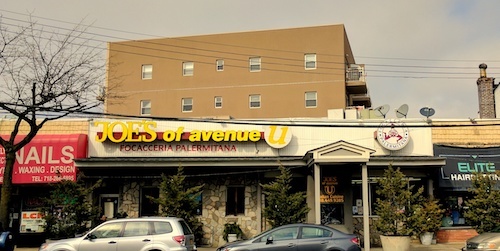 Joe's of Avenue U is reminiscent of the kind of spot you come across while touring around Sicily by car, a typical casual focacceria, serving those quick seafood plates and big sandwiches like the famous vastedda, made with veal spleen. The full menu makes it a bit different, but the relaxed vibes and quality fresh food are very similar.